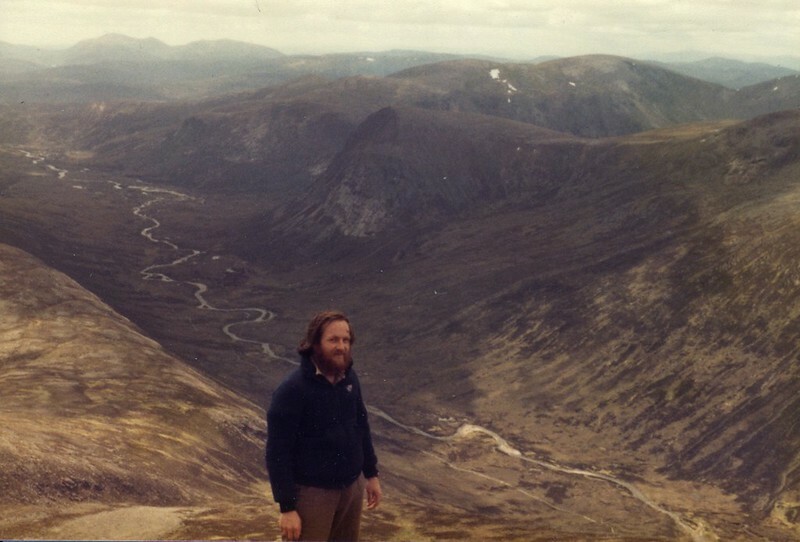 Thirty three years ago Roger and I did our first hill walk together, we backpacked from Linn of Dee to Derry Lodge after work one Friday evening and set up camp (in Roger's 1 person tent), with the intention of climbing Ben Macdui the next day. 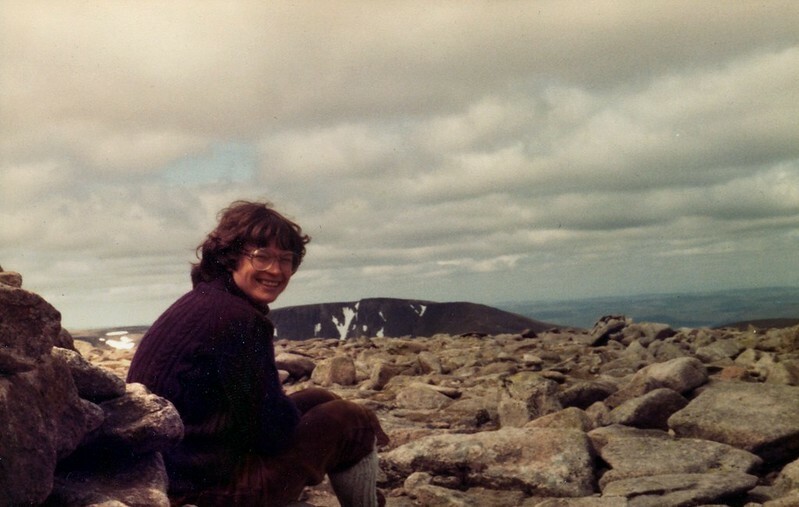 It was very much a trial, of we'd only met about 5 months earlier, Roger was an experienced hill walker and back packer, I'd done some hills and some camping, but backpacking and wild camping was a totally new venture for me. On the Saturday morning we duly climbed Macdui from the south, neither of us can remember the exact route, but I certainly don't remember any paths. The ancient photos show that our hair once had colour (Roger once had lots of it) and that the landscape is more timeless than humans! At the top I remember meeting some people who had walked over from Cairngorm, who congratulated us on having done the hill “the hard way!” Hard way? ... hard way? – why wasn't I told there was an easy way? Neither of us can remember what else we did that weekend, did we go on to Derry Caringorm? 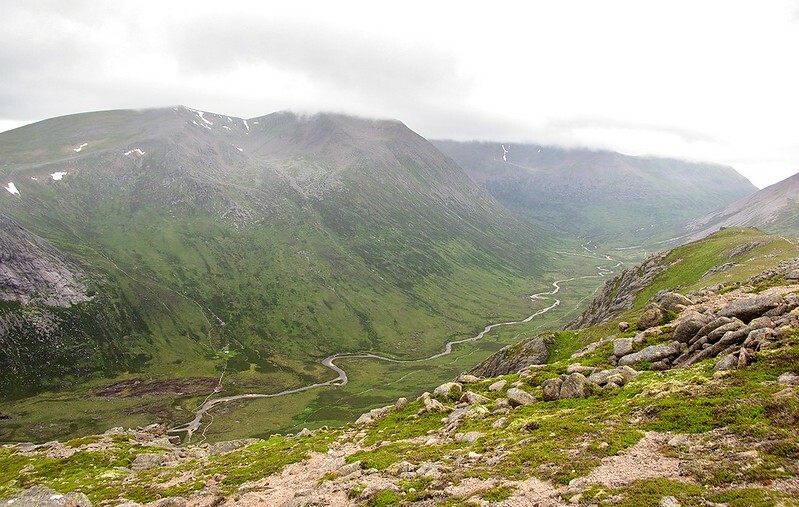 Possibly not – I wasn’t that interested in munro bagging in those day, I was just happy to be out in the hills. What did we do on the Sunday? Don't know. But the weekend had been a success, we bought a 2 person tent and proceeded to backpack and hill walk around Scotland for a couple of summers. 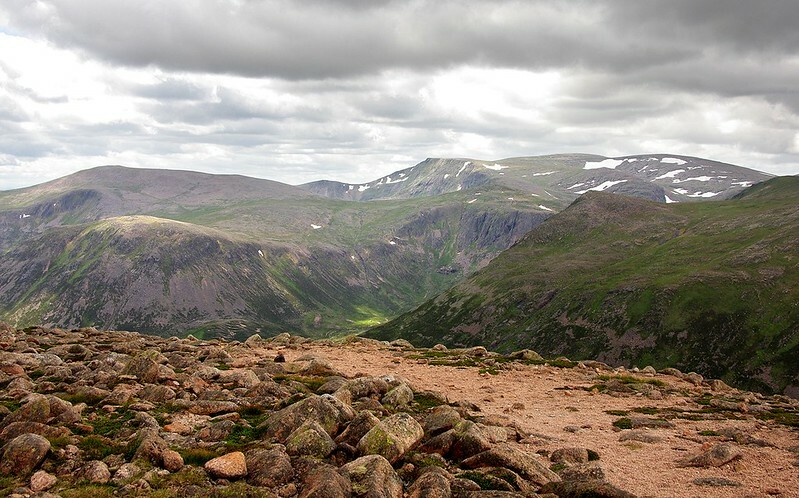 Then came the children and a story of large tents, no wild camping, although plenty of camping holidays, day trips to the hills … and so on … comments on other trip reports suggest plenty of you will recognize the story. 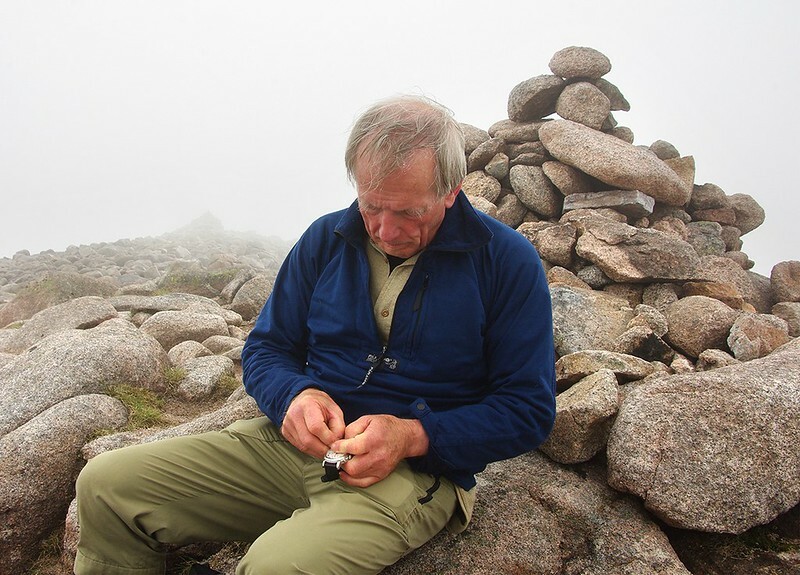 It wasn't a real problem and soon the pleasure of being out in the Cairngorms overcame the disagreements! 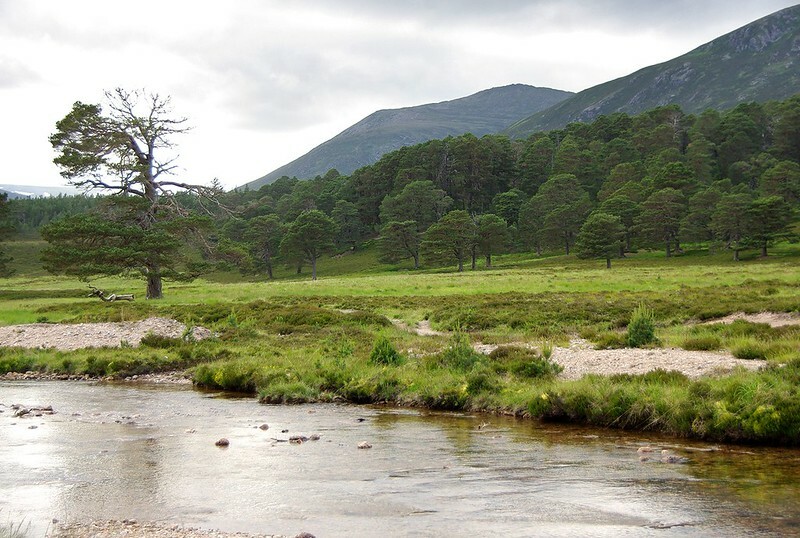 Derry Lodge was quickly reached were we started to set up camp and make an evening meal, welcomed with open arms by the local residents – thousands of them – the midge population. It was a still, balmy evening, Smidge and the pyrethrum coils we burned helped, but the midges were persistent, not to be fobbed off with such flimsy weapons. Do midges ever sleep? 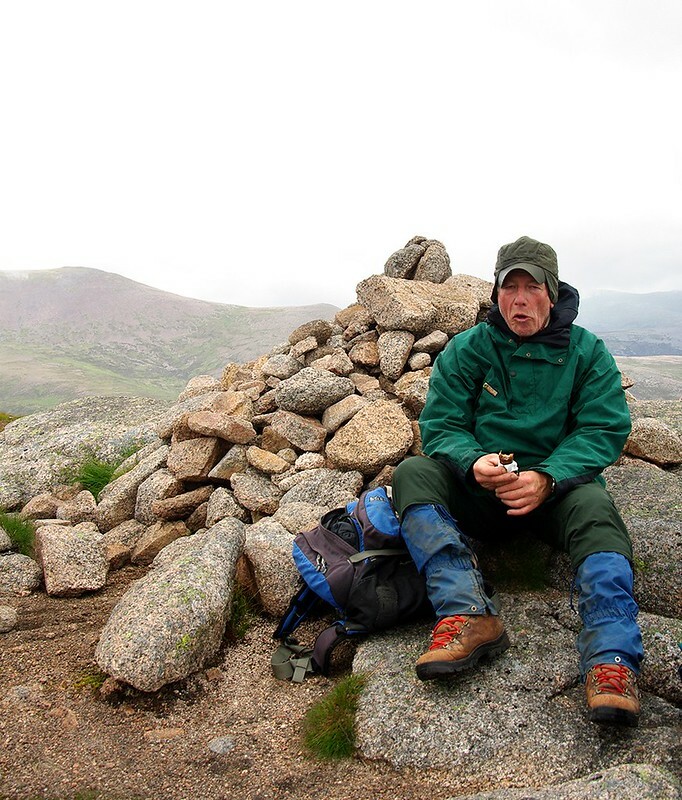 What did they eat before hill walkers were invented? The next morning we awoke to a soft light, no rain, but no bright sunshine either. Peak out of the tent, yes there it was, clag on the hills. It looked harmless, as if it wanted to help us, surely it would lift? 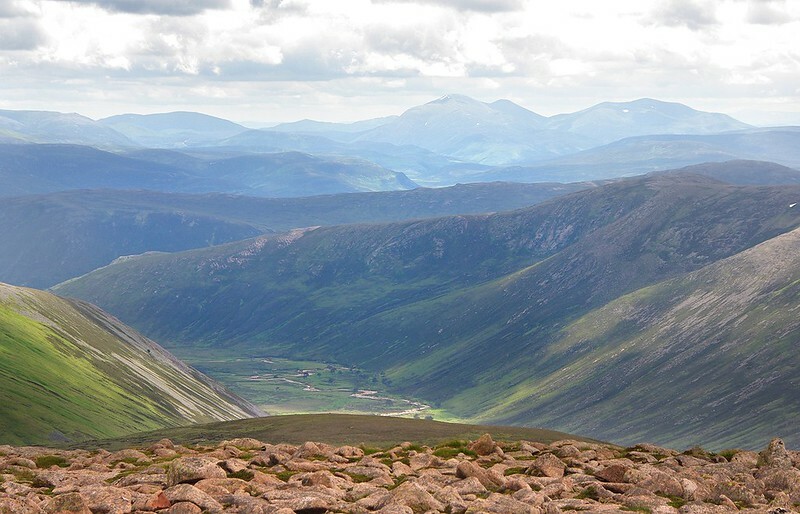 We'd mapped out an ambitious 3 day programme: day 1 - Derry Cairngorm, Beinn Mheadhoin, Ben Macdui and Carn a'Mhaim; day 2 - the four munros on the west side of the Lairig; day 3 - Beinn Bhreac and Beinn a'Chaorainn, then walking out on day 3 back to our daughter's for bath and celebratory dinner! This was only going to happen if the weather cooperated; it had too; we deserved it … didn't we? So slightly anxious but still optimistic we set off, crossed the Derry burn and were soon greeted with the aftermath of a forest fire from the previous week, the result, we gather, of a camp fire that hadn't been extinguished properly. 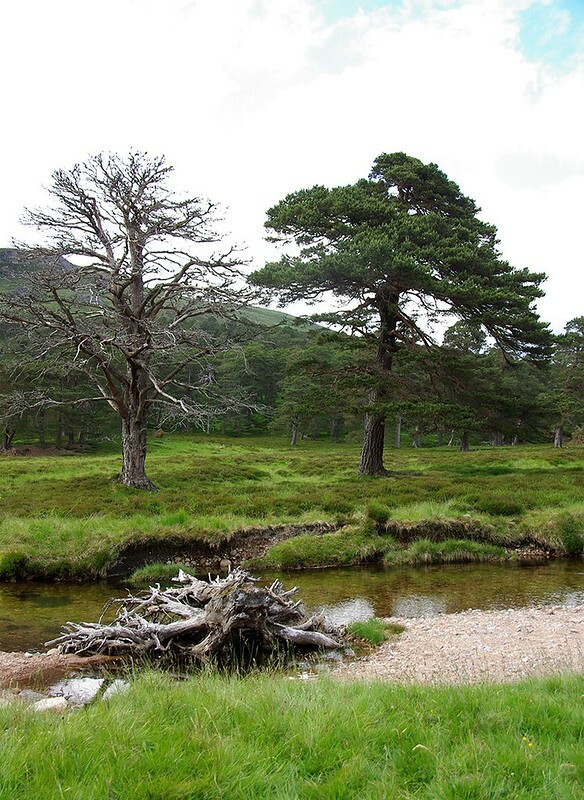 The landscape looks a mess, but nature will quickly turn it green again, and hopefully the trees haven't been too badly damaged. Fortunately no one was hurt in that fire, but it is easy to see how quickly a tent (and any occupants) could have been engulfed. before getting out of the way to let its parent come back. Walking on this terrain with the dogs would have been fraught with discipline problems!! As for the clag, we it played fast and loose with us, sometimes lifting a little before settling down lower that before. 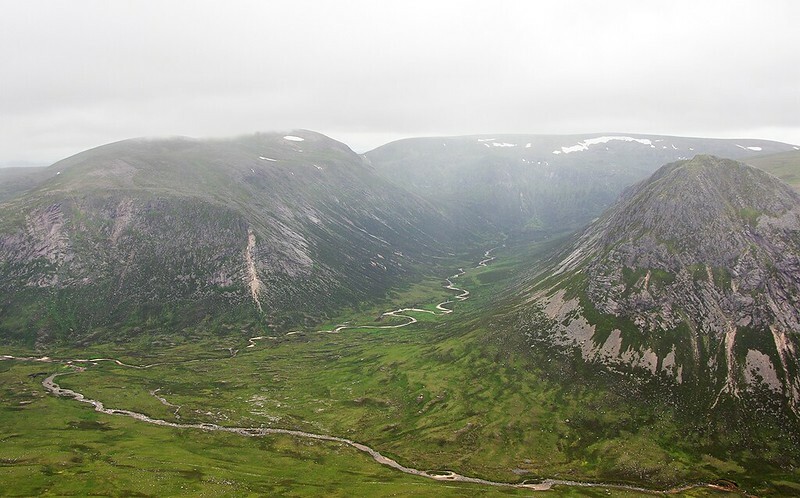 For a while I monitored its progress against a cleft in the crags on Carn a'Mhaim, but as we turned east then north the weather made a decision not to cooperate, and we walked in mist for most of the day. 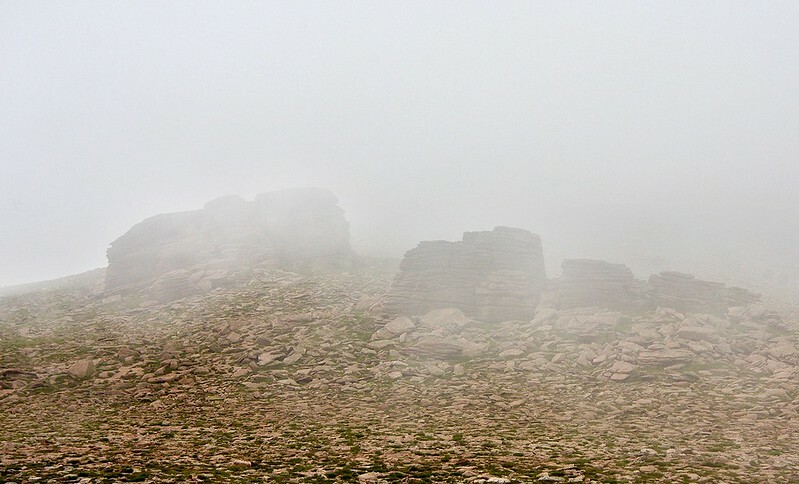 As we neared the bealach we spotted 2 other walkers through the mist following the path from Carn Crom onto Derry Cairngorm. 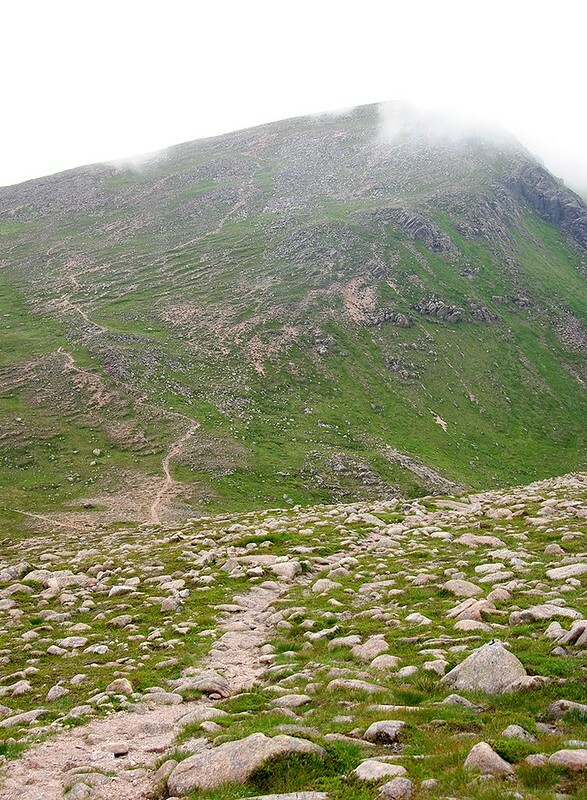 The path is good, no problems and made navigation in the mist easy. I must be honest I'm one of those people who really wants a view from the hills – not just because it's beautiful (well most of the time) but because I like to piece together different bits of the country, the hills and the routes through them, the stretches of water and how to cross them, even the human habitation or remains of it. It was becoming clear that there would be none of that on this walk. But then I began to realise I was picking up something else, something that I would probably have missed without the mist ( ). 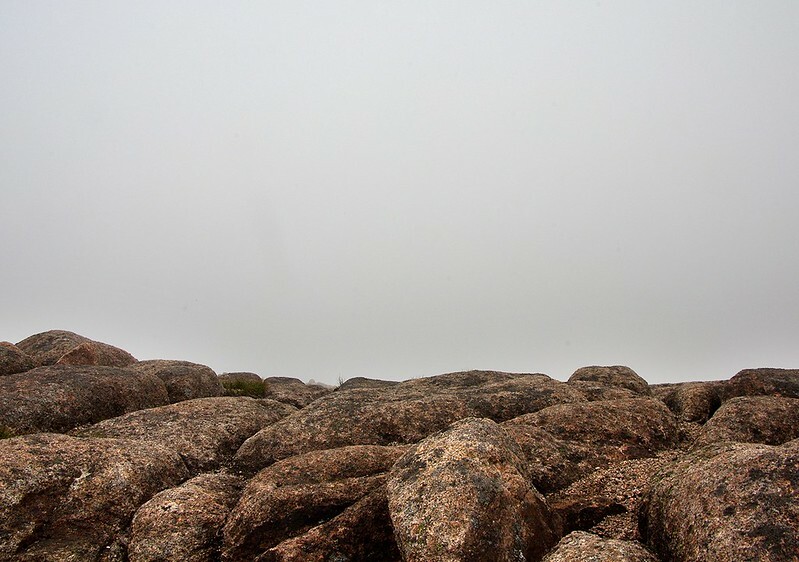 We couldn't see the shape of the mountain in front of us, but we were beginning to feel its presence, the slight breeze was being affected by the bulk of the summit, so we knew we were approaching our first munro even though it was invisible. If I'd been gazing around at the view I'd never had this appreciation of the hidden landscape. At the top we caught up with the couple we'd spotted earlier, had a celebratory cereal bar and Roger mended his watch! The other couple left and we soon followed them, heading north to meet the path from Macdui down to Loch Etchachan. We followed the path from the summit until we had a view of Loch Etchachan and could see the route coming towards us, so we then made our own way down to this path, skirting a large snow slick on the way. Close to Loch Etchachan we met a couple of Dutch girls who had camped here the previous night and were heading up Macdui. We shared our feelings about midges Shortly after crossing the outflow from Loch Etchachan we met three guys who had backpacked in from further north and west and were planning to camp by the Loch to bag the same 4 hills that we were doing that day, only over the next 2 days. Probably a very wise move! and our fleeting release from the clag was over. 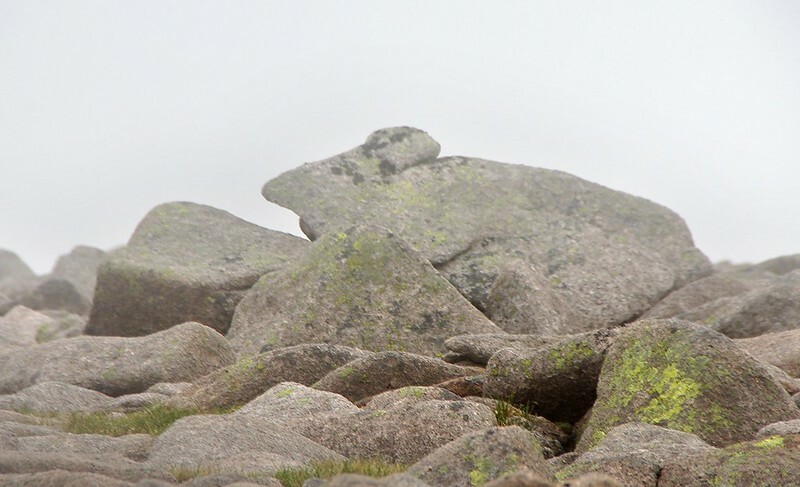 The walk across Mheadhoin was livened up by the antics of a parent Ptarmigan distracting our attention from its chicks – to us it seemed to fly miles away from its brood to lure us away – I hope they were all safe when it got back. (It repeated the performance when we returned by the same route!). 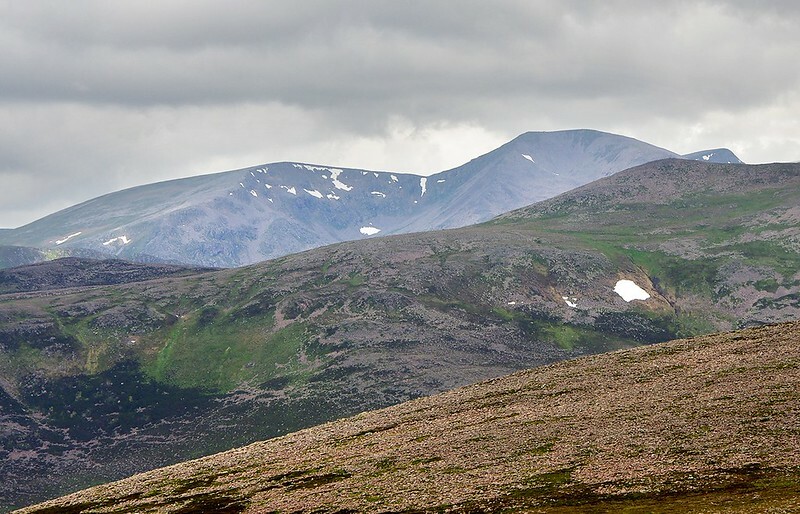 There certainly were plenty of ptarmigans on Mheadhoin, chicks and adults, again I was glad B&B were elsewhere (catching rabbits as we later discovered). The barns along the route emerged silently from the mist, until eventually we reached the summit and the highest barn. We left our packs at the bottom and scrambled up the northern side of the rock to the real summit, only for me to realise the camera was in my pack. Roger nobly offered to scramble back down and take a photo of me ( ). 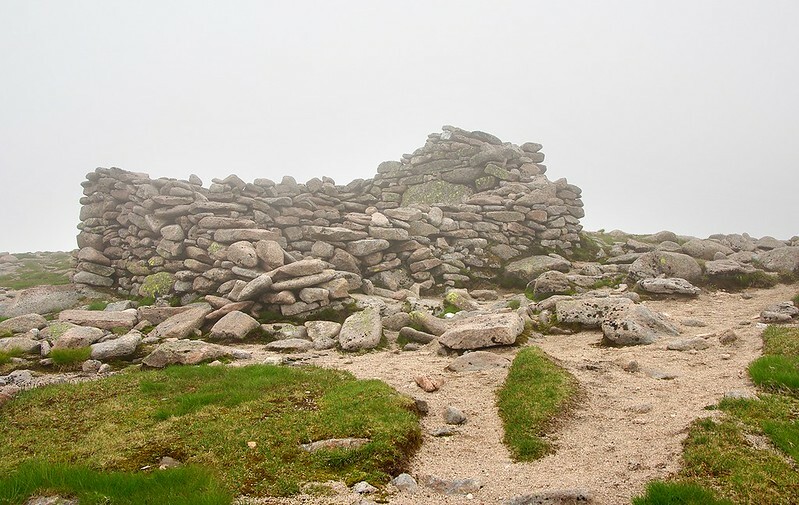 and onto a summit plateau literally littered with shelters and cairns. 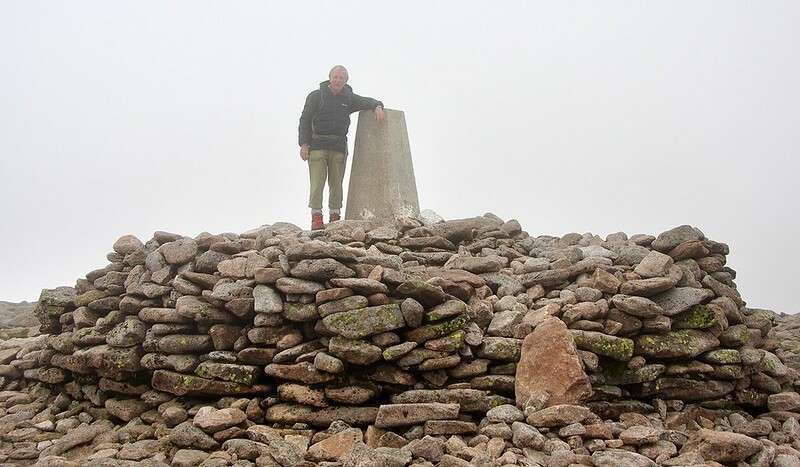 Found the summit trig point – so big that even in thick clag it must be difficult to miss, also found the view finder – rather redundant that afternoon. We selected one of the shelters and settled down for a tea time cuppa and choccie bar, it now being about 5pm. No soon than we'd settled ourselves than along came a group of 5 or 6 birds who seemed very friendly, on the look our for treats? I'm not great at bird identification so I thought a quick photo was in order, as soon as the camera appeared the birds were off, so no spying on them then? 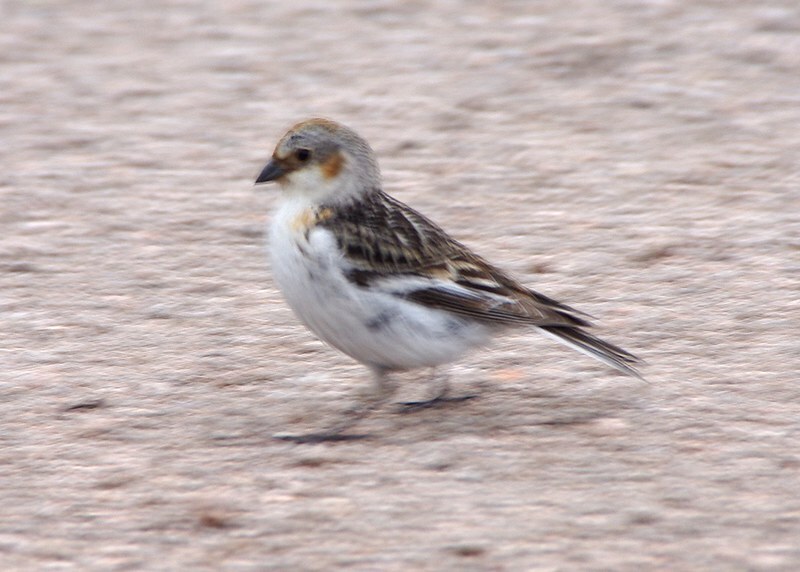 Eventually one came back, but refused to sit still and pose nicely, hence the blurry photo of a snow bunting running around! 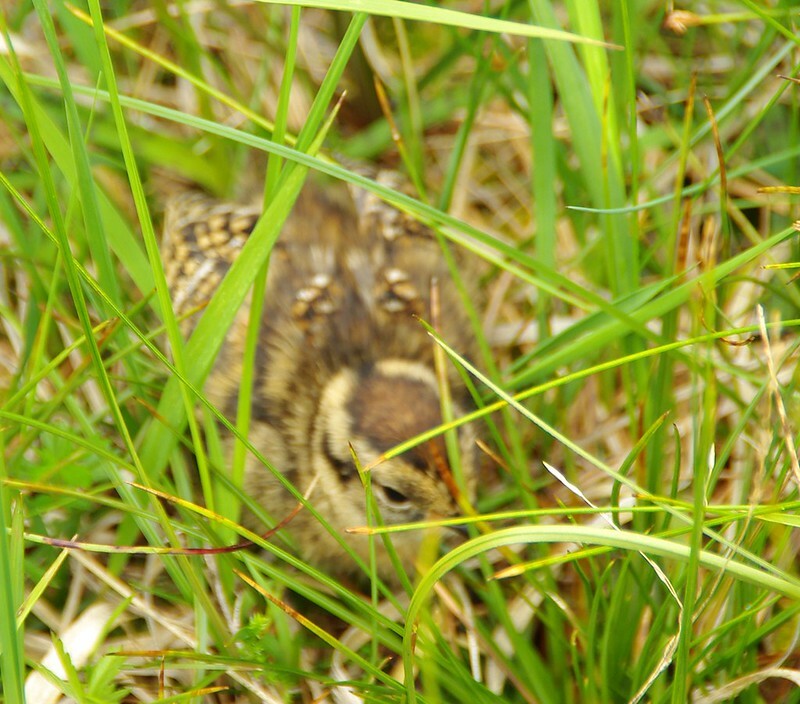 Is this one of the resident birds that inhabit this part of Scotland all year? 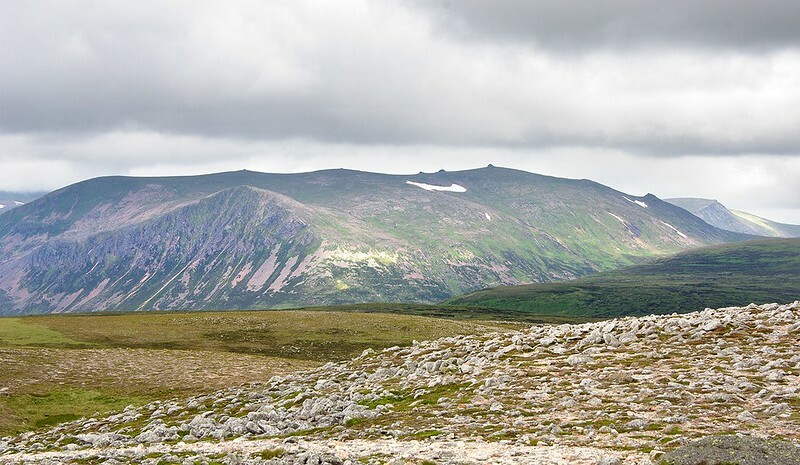 We plotted our route off Macdui to Carn a'Mhaim (although we both realized we might have to abort the last hill in favour of a safe descent by the Sron Raich ridge) but first attempt was to stick with the goal of a 4 Munro trip. 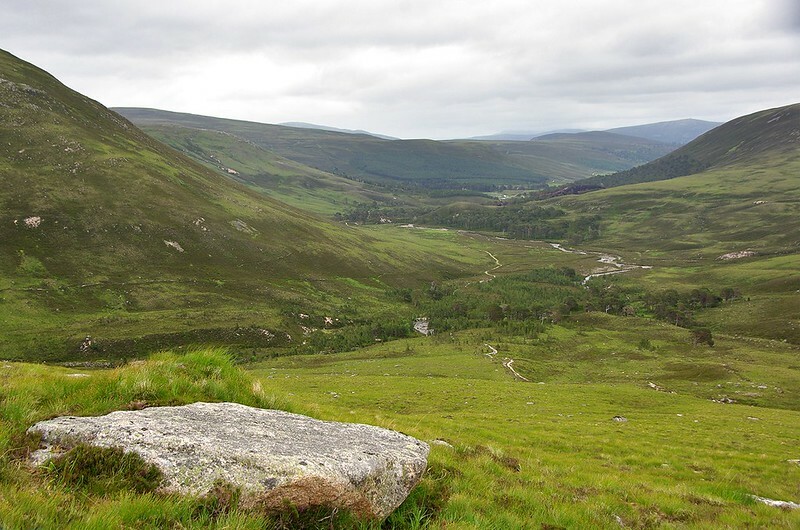 The plan was to follow the path we'd come up on until we met a watercourse on the left, at that point turn south to pick up another water course which would help us drop down to the ridge that would take us on to Carn a'Mhaim. Seems simple? Well, in the rapidly thickening clag it wasn't to be. We lost the path in the boulders, and even using the compass to follow the agreed line we must have gone too far north. Eventually we found a path that seemed to be taking us in the right direction, so followed it. The direction soon shifted from south to west, not hwere we wanted to go, but we stuck with the path. Eventually we realized we were heading back to Macdui, so an hour later we were back where we started, but we had found the path that we'd used to ascend Macdui. 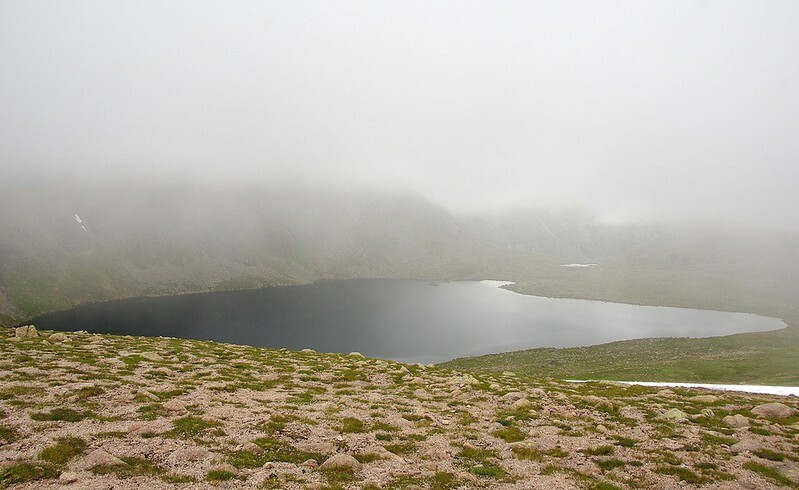 We debated having another go at getting off the mountain the way we intended or using the path to retract our steps to Loch Etchachan, then come down past the Hutchison memorial hut and then head down Glen Derry. In the end we decided that a long safe route might be more sensible than another navigation error, even if it did mean abandoning Carn a'Mhaim for the day . 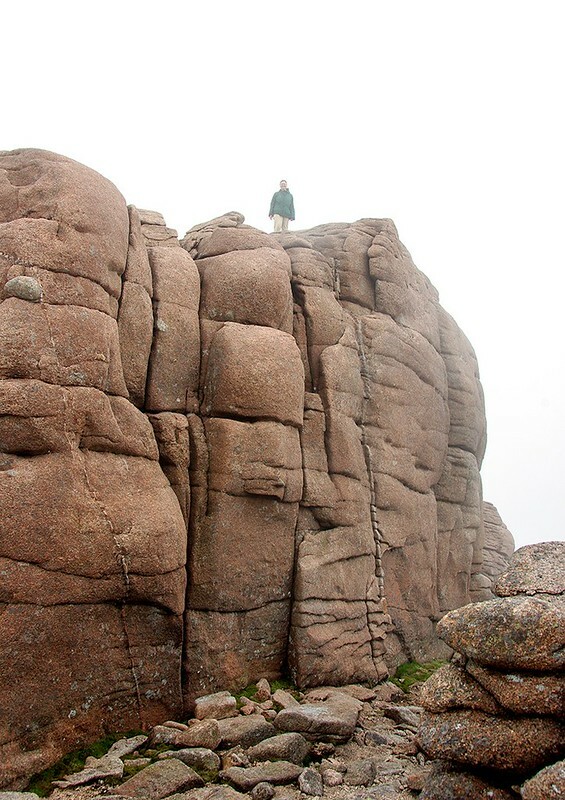 The up side was that we couldn't see anything from the tops anyway and with luck we'd be able to see the glens, I'd never been down Glen Derry and the Cairngorms aren't just about munros – its a great area for the big 'walk through' – so we headed off for a big evening walk through . What can I say – we felt a bit stupid (well a lot stupid really) but the walk out went very well, Queen Vic would have been proud of the path (perhaps). And in all fairness I did enjoy the route. By the time we arrived back at the tent we were tired (14 hour walk), hungry and what was that we could see through the trees? A fire ??? Some campers had lit a fire! While Roger cooked (he's a great chef) I decided to go and have a gentle word about fires. The guys I accosted took it very well – although probably thought I was an interfering old biddy. They knew about the forest fire, were being very careful with theirs, which was only to heat their food, and it was put out safely. If any of them are reading this all I can say is – carry a stove in future (If I did offend that was not the intention and I'm sorry ). After such a long day the food was a real reviver but sleeping bags beckoned, and who knows if the midges carried on biting? Next morning we awoke to the clag even lower than the day before . 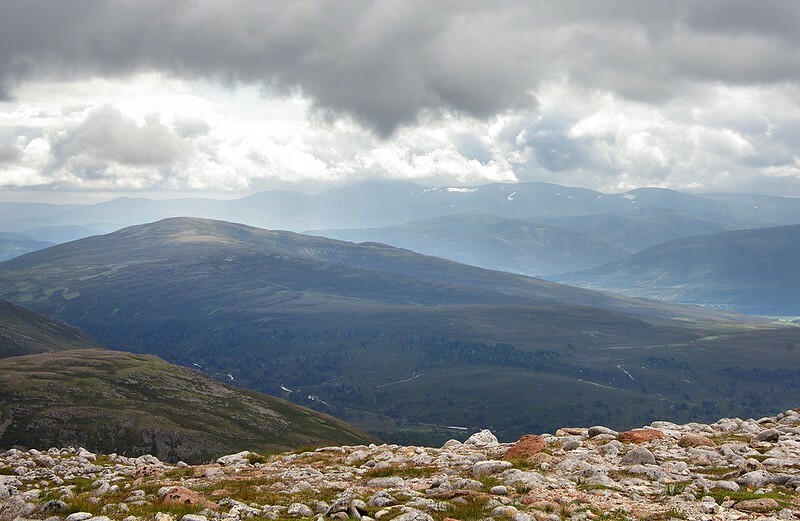 Now the MWIS forecast for the first 2 days of our trip had been very similar – 70% chance of cloud free munros. Yesterday we'd been in the 30%, would today be the same? Over breakfast, and between mouthfuls of midges, we debated what to do. 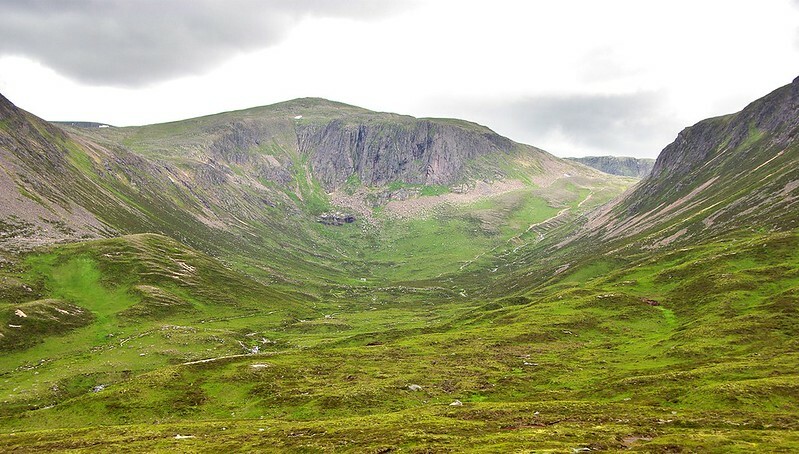 Option 1, bale out because of the weather; option 2 carry on regardless up the 4 munros on the west side of the Lairig; option 3, the weather looks better in the east so head for the hills earmarked for day 3 - Beinn Bhreac and Beinn a'Chaorainn. A group of walkers passed us heading west, so that put paid to option 1. 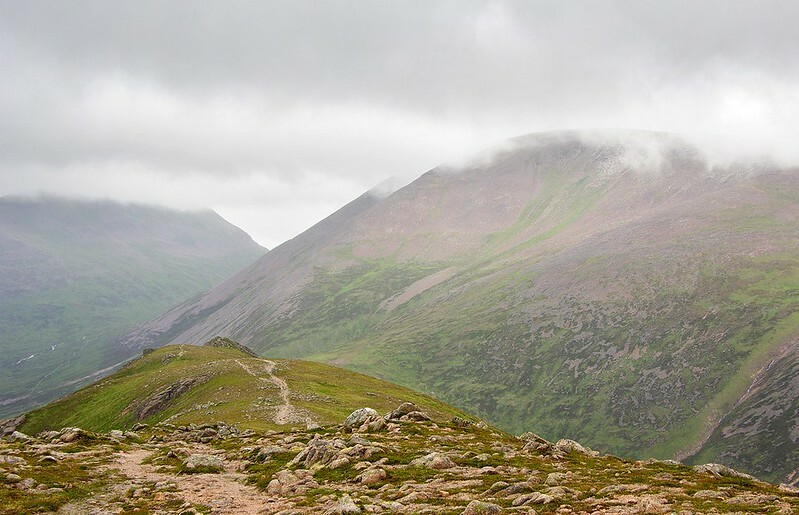 After a clag bound day 1 and even lower cloud this morning option 2 didn't seem too attractive, so option 3 it was. We finished eating upped and offed for Beinn Bhreac and Beinn a'Chaorainn. The downside this choice was that we didn't think we'd have time to do the Lairig route on day 3, instead day 3 would become a very short day doing only Carn a'Mhaim... so you can imagine our joy when about an hour into our walk the clag lifted above the big peaks – and stayed above them all day. “Och wheel that's life” is, I suppose, the polite translation. 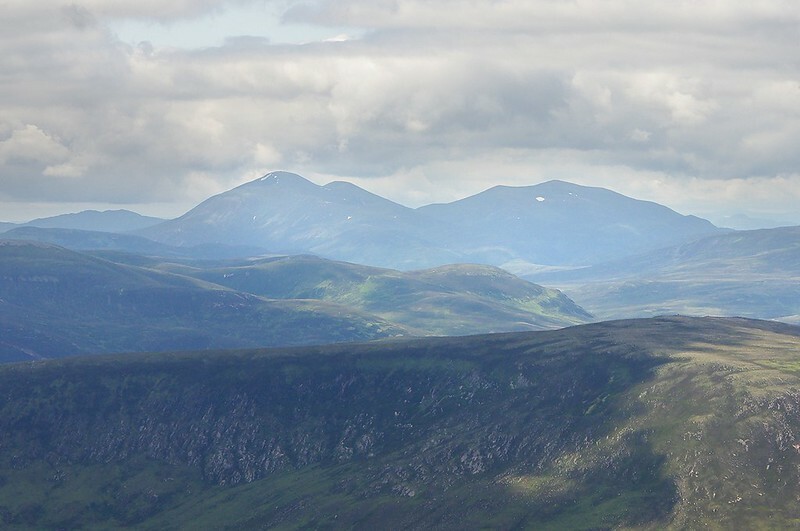 We did have a great day though – we just followed the Walk Highland route up to Beinn Bhreac and its superb views. For the second day in a row we were at the top of a mountain by 10:30am – aye this is the life. 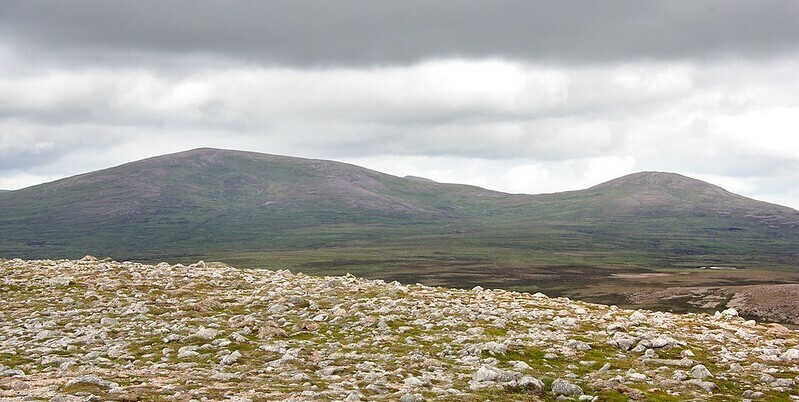 North towards Beinn a'Chaorainn - across the fearsome peat hags. 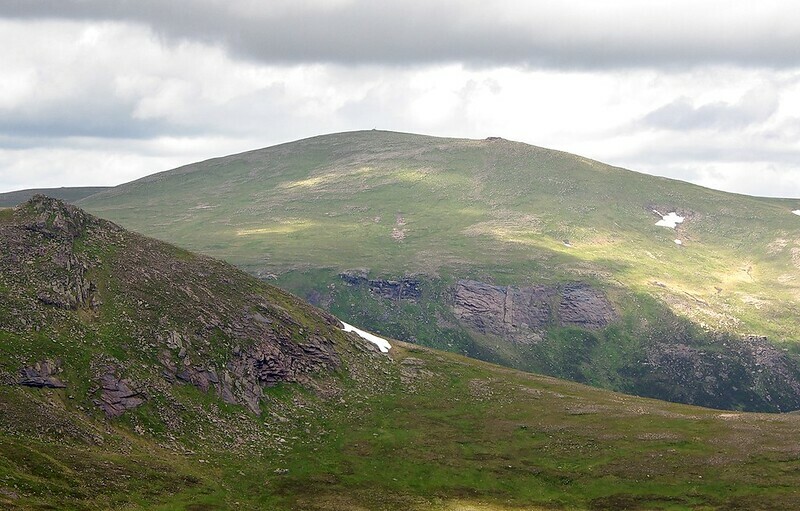 There is a very clear path north to Beinn a'Chaorainn, onto the bogland of the Moine Bhealaidh. The walk description talks of keeping to the east to avoid the worst of the peat hags – we did - and then that the path peters out in a bog (it did) but can be refound, (it was) before petering out again for good, (it did). 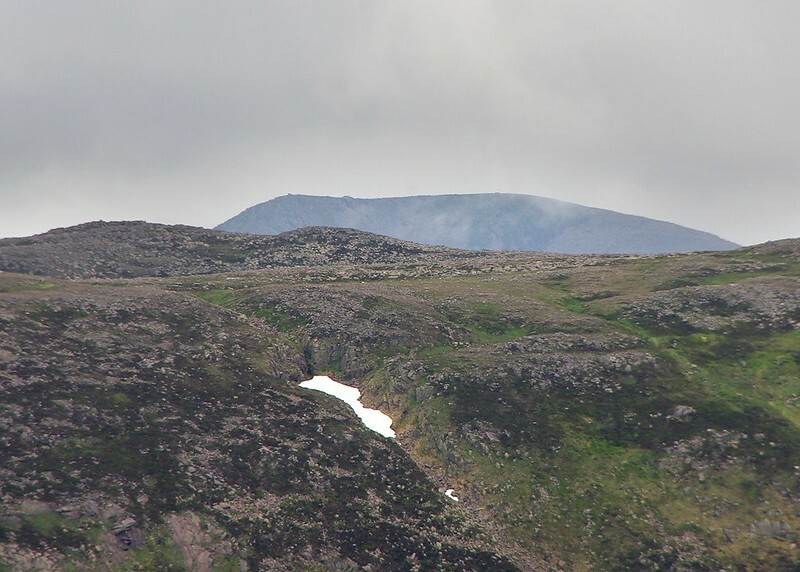 Once we lost the path there seemed 2 main options – keep to the higher ground to the east, round onto the flank of Beinn a'Chaorainn Bheag (hill on the right in the photo), then contour round to the bealach then up onto Beinn a'Chaorainn itself – the long way. The short way is to follow the WH route onto the south east flank of Beinn a'Chaorainn, which after a lively debate is what we did, this route does lead across an area which would be treacherous if it hadn't been so dry, in wet conditions it might be better to keep to the high ground. We gained the summit easily, noticed someone coming up behind us. By the time we were having lunch he joined us at the top, ate, took some photos and left. We had a great time indulging in some mountain spotting, marveling at the mountains we had climbed but hadn't seen the previous day and musing about walks to come, oh and taking more photos . When we finally headed off we followed a route south south west, sometimes on a path and sometimes not. 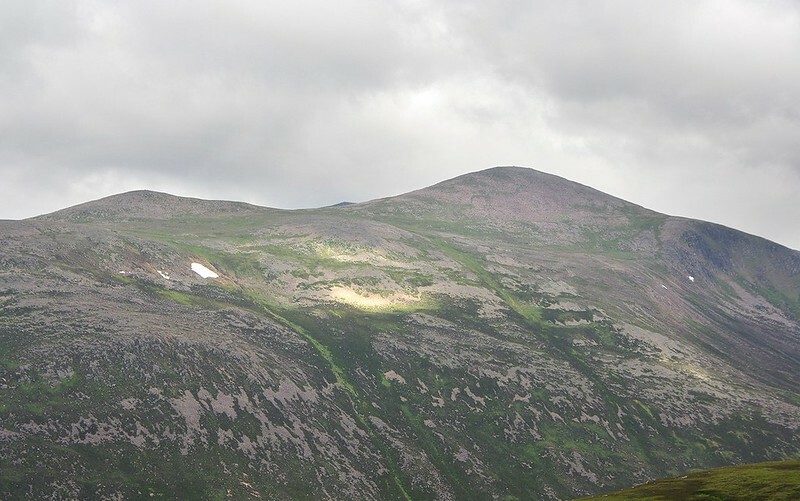 We did pick up the path just before it headed into the steep descent into the Lairig an Laoigh and then into Glen Derry and our route the previous evening. Corrie Etchachan from the oposite end, minus the clag! This time we were back at the tent about 5pm, in time for a relaxed cuppa before suppa. About an hour after we got back the walker we'd seen at the top of Beinn a'Chaorainn passed us heading south. Apart from feeling cheated that we'd missed doing the four big munros we'd originally planned this had been a lovely day, with plenty of time to see the landscape we'd missed the previous day. 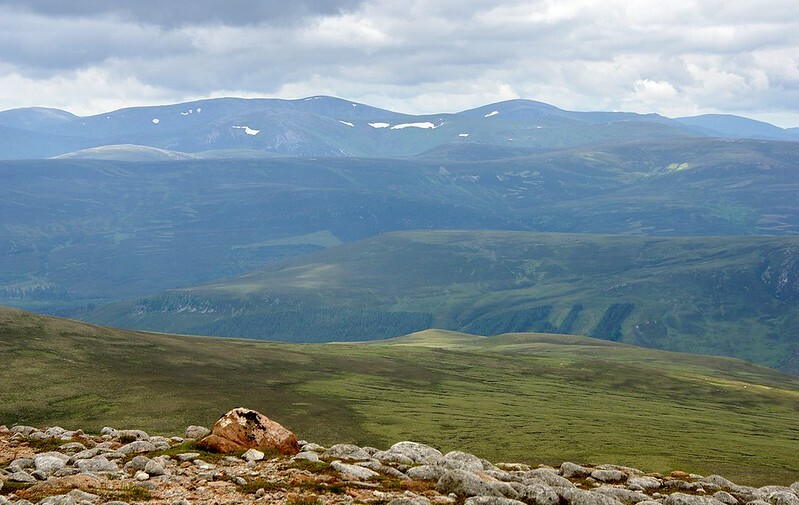 We'll just have to have a return trip for Carn Toul and the others - not really a hardship... perhaps the beginning of next month . Our final morning dawned clear and breezy – therefore NO MIDGES. A quick breakfast then we were off to Carn a'Mhaim, which we could see clearly from the tent. What can I say about this route? 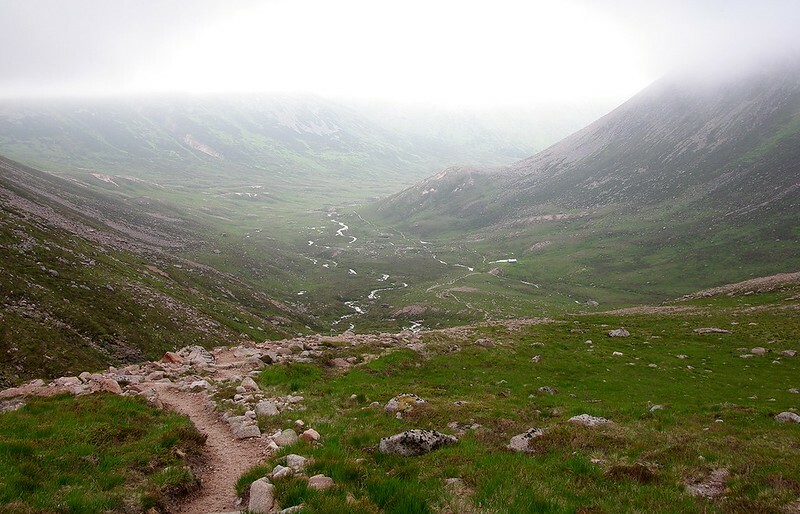 Follow the path towards the Lairig Ghru, ford the Luibeg, take the path that leads off on the right and follow it to the top. Oh it does go up some steep sections, but its a really clear path all the way to the top. followed by photos and this time, a reccy of the hills opposite and possible camping sites for our return match. Back at the campsite, a quick lunch then we packed up and off to Linn of Dee and the drive back to our daughter's, where bath. food and a stiff drink (or several) awaited us … oh not to forget Biggles and Bertie, who had been stunning guests – helping out at rabbit hunts (3 bunnies dispatched) and attempting to dig out of their luxury hotel (the vinyl on the utility room floor will never recover). Not sure where they'll be welcome on our next backpacking trip. Last edited by Huff_n_Puff on Mon Jul 21, 2014 10:30 pm, edited 1 time in total. Most enjoyable read with the usual excellent photos! 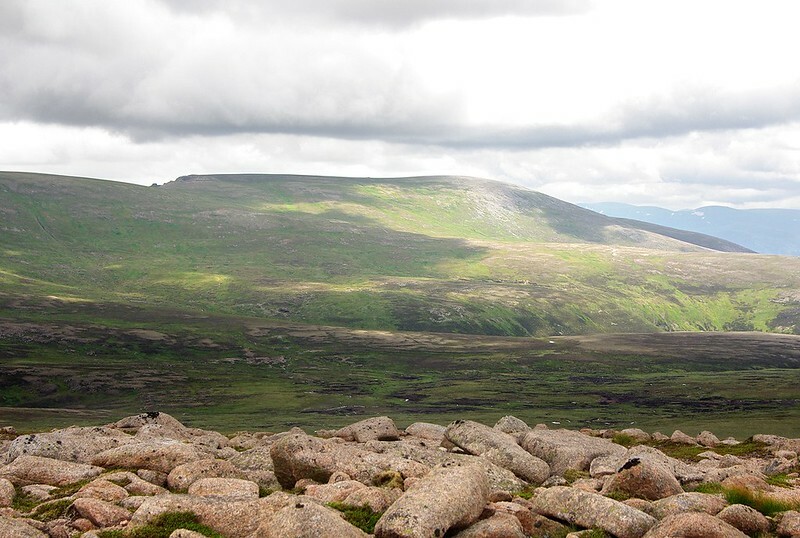 I'm now wondering if I've misidentified as Glen Ey hills what is actually Beinn a Ghlo (in Derry Cairngorm report). Oh well, no one has corrected me - yet! Love the pics from 33 years ago - although one of you really hasn't changed much! I had a pair of walking breeches like that and felt like the landed gentry in them. It really transfers the almighty mass of the plateau!! dogplodder wrote: Most enjoyable read with the usual excellent photos! 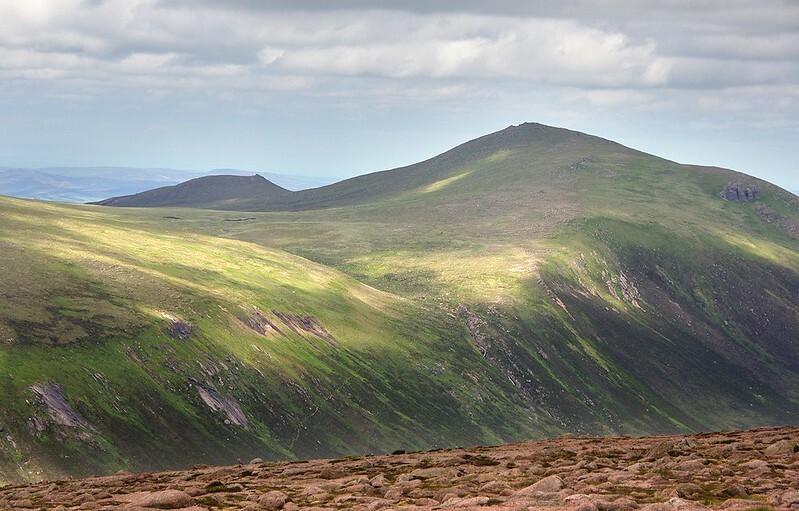 I'm now wondering if I've misidentified as Glen Ey hills what is actually Beinn a Ghlo (in Derry Cairngorm report). Oh well, no one has corrected me - yet! Cut down cords even better! Meant to say hat's off to you for speaking to the guys with the fire. I'm not sure that being careful is the point. There are clear signs around Derry Lodge saying no fires and it was pretty insensitive to light a fire after 150 fire fighters were out dealing with a camp fire that spread the previous week. The cost of that operation would have been huge and lives were potentially put at risk elsewhere. You were quite right to say something.